Do you often find dandruff flakes on your shoulder? If yes, you could understand how embarrassing it could be. Dandruff is a common hair problem we often face at least at one point of our life. It is not really difficult to get rid of this irking condition. However, you need to follow a regular hair care routine to make sure this problem doesn’t recur again. All you need to do is rush to your kitchen. Yes, you heard it right! Simply go pick the jar containing baking powder. 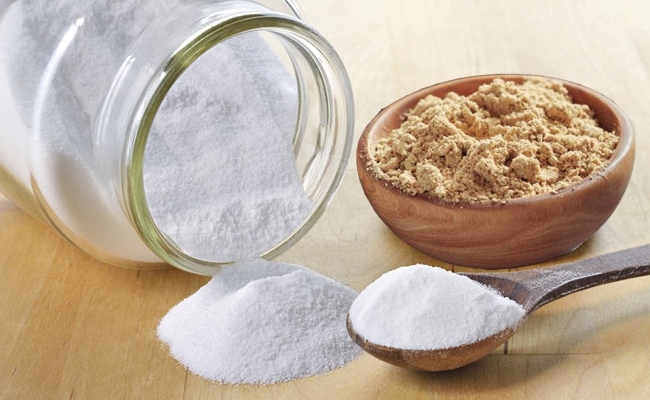 Baking powder is one such kitchen ingredient that helps eliminate this condition. 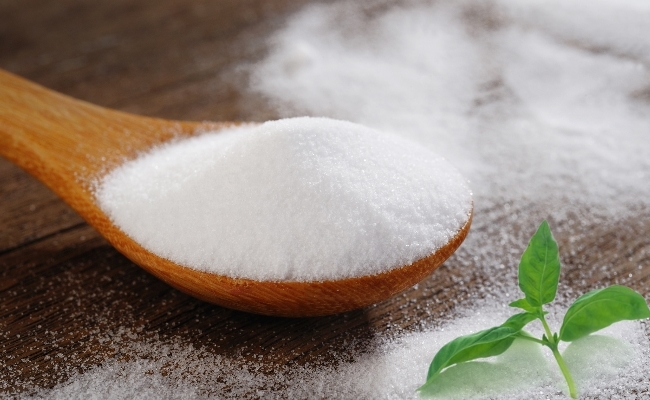 Also, known as baking soda and acts as an antifungal agent that helps in inhibiting the growth of the fungi. It is even helpful in cleaning your scalp effectively by removing those dead skin cells on the scalp. 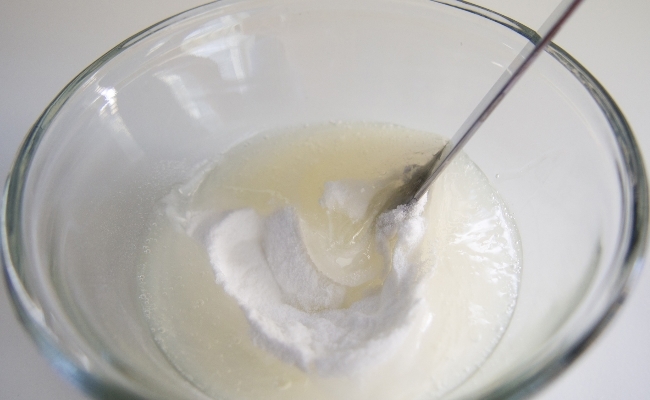 Prepare a thick paste of baking powder and water and apply it as a hair mask. You need to take a few tbsp. of baking powder and make a fine paste of it using water. Dampen your hair and apply this mixture on the scalp. Gently massage in circular motion and create a scrubbing effect. Leave it for a few minutes. Wash off your hair with warm water. Whenever you shampoo your hair, you get rid of the oil and grime. 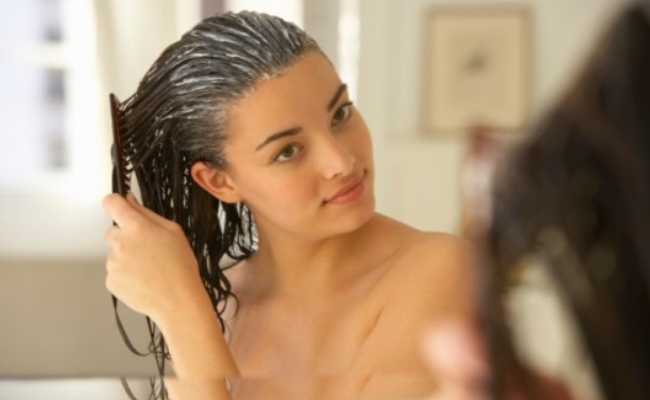 When you apply conditioner to your hair, you will be actually providing your scalp with some oil again. Using chemical-based hair conditioners regularly might aggravate dandruff problem which might even lead to hair fall. So, use baking powder as your hair conditioner. 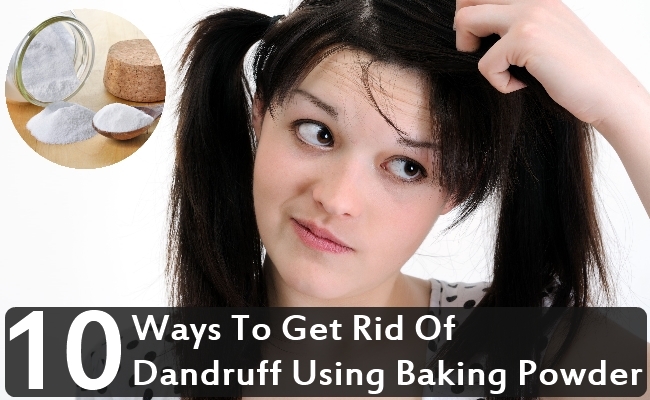 Using baking powder helps in removing the extra sebum without drying your hair extensively. You can even wash off your hair using baking powder to prevent your hair from being sticky and greasy. Add 2-3tbsp of baking powder to a cup of lukewarm water. 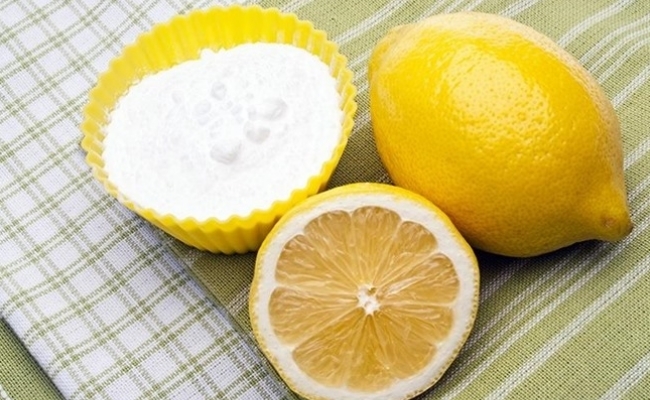 Mix it well and use this solution to wash off your hair. This treatment helps in getting rid of this embarrassing dandruff problem. It is alkaline in nature and helps restore the pH balance of your scalp. 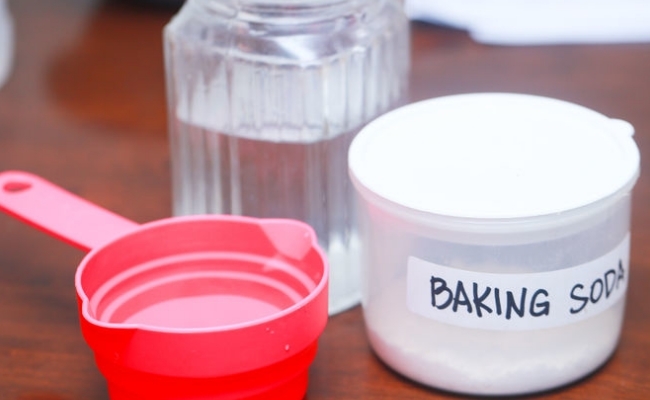 You can use baking powder as arise more often by adding some baking powder to your shampoo. Pour some shampoo in a bowl and add a tbsp. of baking powder to it. Mix it well and use it as a regular shampoo to notice the amazing results within a fortnight. 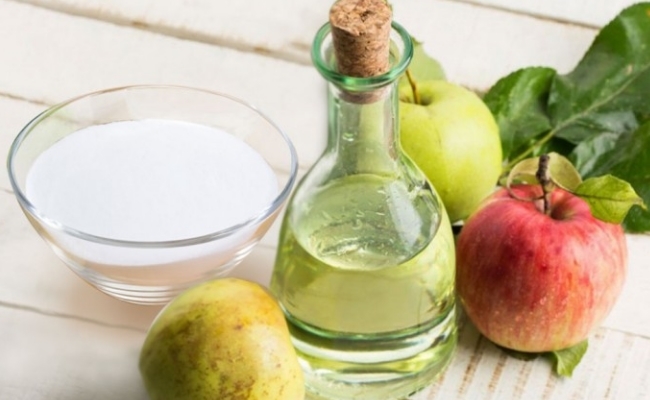 Baking powder when combined along with apple cider vinegar helps in balancing the scalp’s pH apart from controlling the hair from being sticky. Add a tbsp. of baking powder to some apple cider vinegar and massage this mixture on your scalp to remove the dead skin cells. Rinse off with warm water and follow the same for a few weeks to notice remarkable results. Both ginger and baking powder have antibacterial and antifungal compounds that help inhibit the growth of the fungus and keep dandruff at bay. Add a tbsp. of baking powder and one tbsp. of ginger extract in a cup. Dilute it with water and use this mixture to massage your scalp. After a few minutes, rinse your hair with warm water. Prepare a hair pack by mixing a tbsp. of baking powder to a cup filled with beetroot juice. Use this mixture to apply on the scalp. The scrubbing effects of baking powder help clear the dead cells and dandruff flakes on the scalp whereas beetroot juice helps inhibit the fungal growth apart from soothing your scalp. Both these ingredients help in clearing the dirt, excess sebum, and other impurities on your scalp which can further help eliminate dandruff problems. Add a cup of baking powder to a few tbsp. of lemon juice and mix it well. Use this paste to gently scrub off your scalp and leave it for 2-3 minutes. Wash off with warm water and follow the same once every two days. Basil leaves act as an antiseptic and has potent antifungal properties as well which help kill the fungus thriving on the scalp apart from soothing it. Blend a handful of basil leaves into a paste and add a tbsp. of baking powder. Apply this paste on your scalp to completely stay away from dandruff. 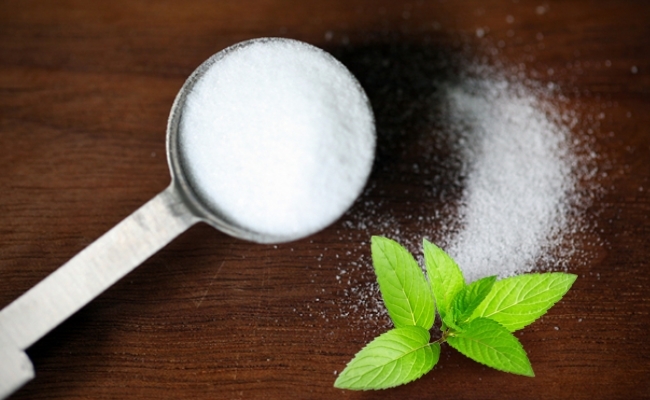 Prepare a hair mask by mixing both mint juice and baking powder. Apply it on the scalp. This treatment helps eliminate dandruff, soothes an itchy scalp, and leaves behind a fresh fragrance on the hair. 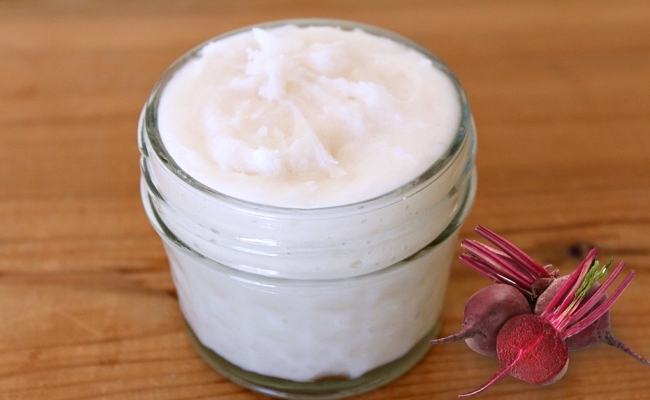 7 Promising DIY Natural Oil-Based Scrubs For Cleansing And Nourishing Your Scalp!